Megan Perkins finds inspiration in everyday scenes. Rain, shine, snow or wildfire smoke, Megan Perkins stayed true to her commitment to paint a Spokane-centric scene at least once a week for a full year. This meant sometimes parking across the street from historic buildings, frequent subjects of her Artist's Eye on Spokane series, occasionally running the engine so she didn't get too cold while painting the brick facades in watercolor. She also sketched from the announcer's box of a Spokane Indians game in the peak of summer heat, at a downtown fire station while crews intermittently rushed to and from calls, and while surrounded by the art deco splendor of the Fox Theater before a performance. On a sunny and warm May morning, Perkins is perched atop a concrete retaining wall in Huntington Park, sketching the suspended, momentarily immobile gondolas of Riverfront Park's SkyRide. The artist deftly mixes splashes of indigo and violet paint in the plastic lid of her watercolor palette to get the deep lilac hue of the gondolas just right. The rushing Spokane River and sounds of nearby construction echo through the parkside river gorge as newly minted Washington State University grads pose for photos on the slope below. "I liked the way the three gondolas stacked up and ended below the skull sculpture on the [Monroe Street] bridge," she explains of today's chosen scene, adding that sometimes she knows exactly what she wants to include in her landscapes based on a previous visit. After doing this for a year, Perkins has also perfected her mobile art studio setup: a black tote bag holds her sketchpad, a pencil/brush pouch, two watercolor palettes, a water bottle, a plastic baggie of paint-stained paper towels and a small jar of water to wet and rinse her brushes. "Watercolor made sense because it's a medium I've been working in for over 10 years, but also because it's portable and easily cleaned and not terribly messy," Perkins explains. "It's not the end of the world if I get it on something, and it dries fast so I can close the sketchbook and walk away." Though weekly on-site painting for Artist's Eye on Spokane officially culminated in early May, Perkins says she's not entirely transitioning away from local landscapes. She already has plans for another Spokane-centric painting series and is currently working on a project to showcase select pieces from Artist's Eye in an art journal-style book set to release later this year. "There are still some things on the list I need to get to," she notes. 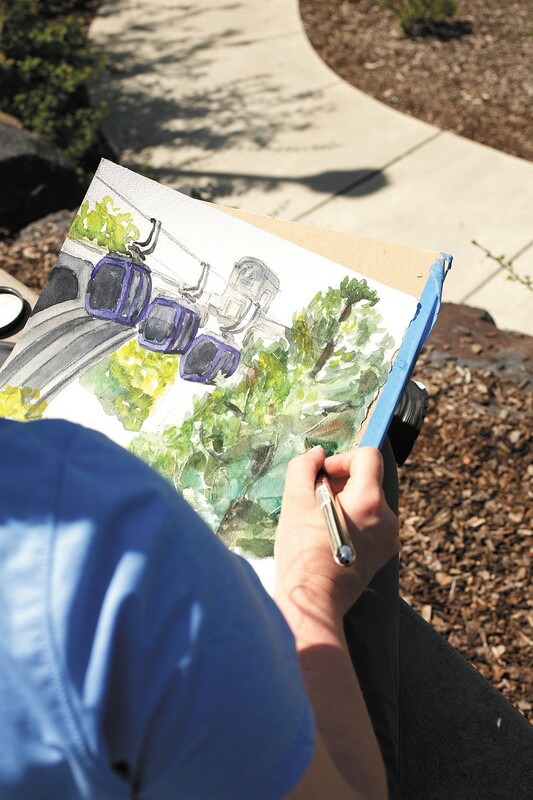 "I've done the 52 weeks, but that doesn't mean I'm done sketching Spokane. It will continue, but at a little bit of a more relaxed pace so I have space to do other projects." Perkins estimates she completed more than 200 pieces, including rough sketches of people in action at many events she chose to highlight. The past year's paintings for Artist's Eye on Spokane can be viewed on both her personal and project-centered Instagram accounts, @perkins_megan and @artistseyeonspokane. Perkins' residence in Spokane began more than a decade ago as a student at Gonzaga University, where she studied biology and history. After graduating, she married and moved back to the area in 2011 from her home on Washington's west side. Perkins teaches art classes at venues including the Corbin Art Center and Spokane Art School and works part time at Pottery Place Plus artist cooperative, where she also sells her art in print and greeting card form, along with some original pieces. Though she didn't study art in college — "I've always wanted to be an artist, I was just told it's not financially tenable," she says — Perkins has always loved the creative outlet, and says she got back into drawing and painting while rehabilitating from a repetitive stress injury in her arm. As a transplant to the Inland Northwest, part of Perkins' original intent to paint around Spokane was to better acquaint herself with the city. 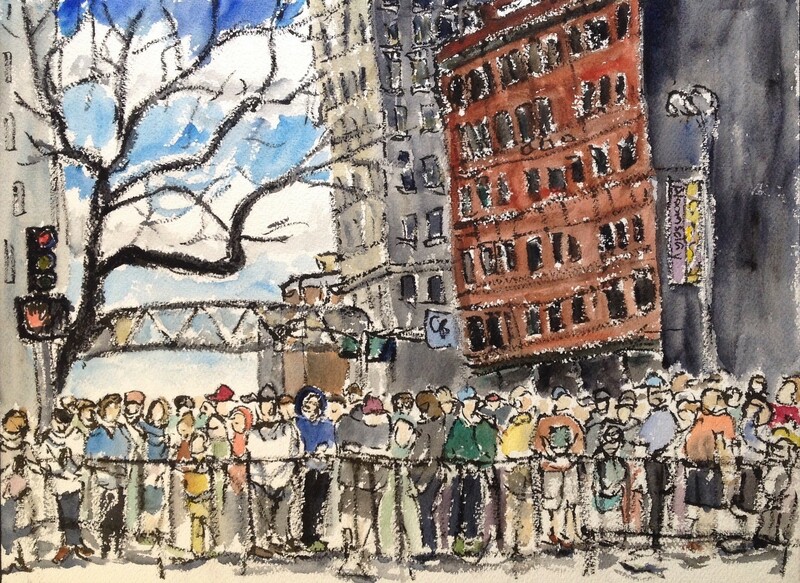 Fittingly, the series kicked off with Perkins live-painting scenes of last year's Bloomsday race. "Because it was a project I had been wanting to do for quite a few years at that point, I had an internal mental list of things I kept driving by, but when it came to getting into my car and driving there and being there [to paint], it was a matter of that actually happening," she says. Her list contained all the obvious local landmarks and traditions: Hoopfest, the Fox, the Milk Bottle, Spokane County Interstate Fair, Auntie's Bookstore and other spots she considered "Spokane institutions." She painted local churches and schools, the Steam Plant's iconic stacks and scenes of neighborhood business districts — Garland, East Sprague, Hillyard and South Perry — as well as Green Bluff's farms, Manito Park's gardens and St. John's Cathedral's stained glass windows. 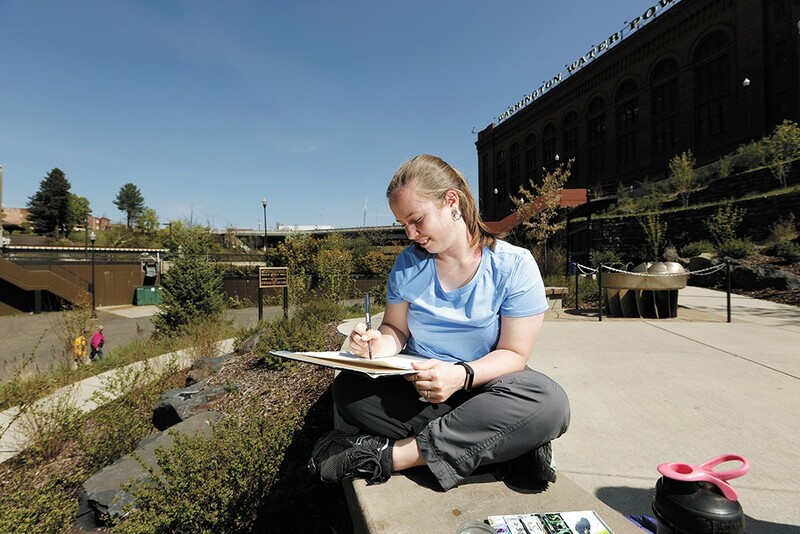 She often asked friends, local art patrons and longtime residents to suggest places they thought she should paint, too. Perkins has shown original paintings from Artist's Eye on Spokane at a handful of venues for First Friday, and currently has two pieces in this summer's juried landscape show at Gonzaga's Jundt Art Museum. Another painting for the series, of the Manito Park Gaiser Conservatory's holiday lights display, was selected for the Chase Gallery's all-media show this fall. And in a few weeks, a dozen or so paintings from the series will be displayed in the newly renovated lobby of Spokane City Hall and featured for July's First Friday. The original print version of this article was headlined "En Plein Spokane"